HARLINGEN — Left for dead during an armed robbery, Leonel Garza Jr. believes he was given a second chance at life for a reason. With the help of Texas State Technical College, he has set out to make it the best life he can. 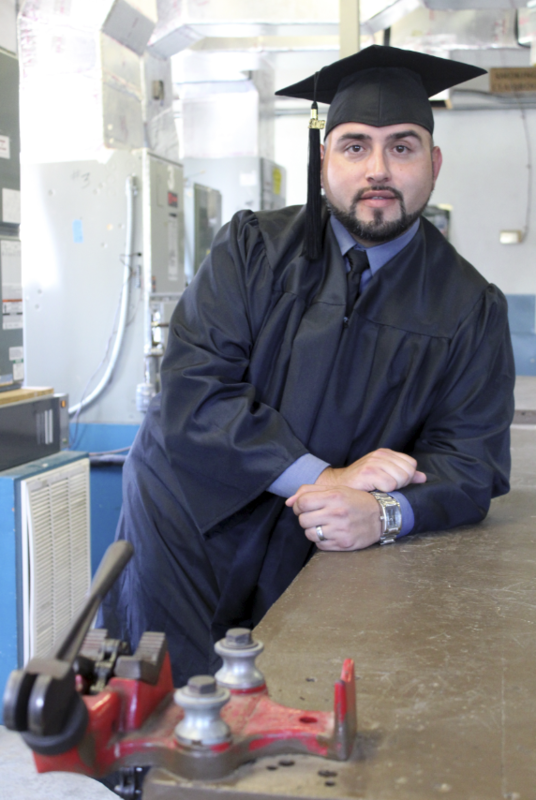 Friday, the 33-year-old McAllen native put on his cap and gown and walked the Harlingen Municipal Auditorium stage to receive his associate degree in Heating, Ventilation and Air Conditioning (HVAC) from TSTC. He still remembers every detail of April 28, 2016, the day an armed robber entered his apartment in Irving, Texas, at 6:45 a.m.
Garza and his 65-year-old roommate were shot by a would-be robber. “Abuelo” was shot in the chest and Garza was shot five times on his right side and back as the gunman demanded money and items. Garza said he remembers thinking that he had to live for “Abuelo,” who survived the attack, and for himself. Garza had only been in Irving a few months on that fateful day. He had recently left a 10-year job as a security guard with the Pharr-San Juan-Alamo Independent School District, was celebrating the completion of his HVAC certificate at an Irving vocational institute and was looking to start a new career. Since then, Garza has returned to the Rio Grande Valley, married and now has a 1-year-old son. He struggles daily with depression and post-traumatic stress disorder, but that has not stopped him from achieving his goals and living his life to the fullest. During his time at TSTC, Garza maintained a 3.75 grade-point average allowing him to graduate with honors, served as president for TSTC’s SkillsUSA chapter and parliamentarian for the Texas SkillsUSA chapter, even traveling to Louisville, Kentucky, last month for the SkillsUSA national conference.